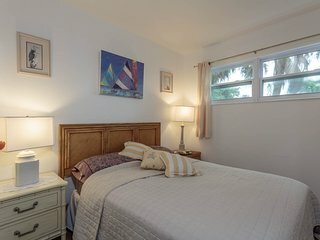 FMY4201 is situated in a quiet residential area on Fort Myers Beach less than 300 yards from the white sandy beach of the warm Gulf waters. 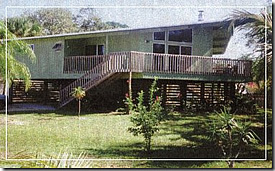 Standing on stilts, with a car port below, the house is fully furnished to accommodate eight guests. With Golf Courses, Fishing, Boating, Parks and the Fort Myers Beach Pool all nearby, we are sure that our spacious house will fulfill all of your vacation needs. This detached house, with four double bedrooms and two bathrooms, consaists of 1,400 square feet of living area, and is situated in a quiet residential area on Fort Myers Beach, Estero Island, less than 300 yards from the white sandy beach on the warm Gulf waters. It is fully air-conditioned with heating available should this ever be necessary. Ample bed linen and towels are provided. Rental of the home is fully inclusive of electricity, water and garbage collection. There is a telephone in the living room. All local calls are free. The Living/Dining area is open plan and links to the kitchen. The living area has seating for eight people and is equipped with cable television and a video/dvd player. Two patio doors open onto an expansive deck. The dining area has a large dining table and 6 chairs. The Kitchen is equipped with a small table and four chairs, an electric cooker, microwave oven, coffee maker, toaster, large refrigerator, and includes a dishwasher and a waste disposal unit. There is a full complement of cutlery, crockery and cooking utensils. The Master Bedroom has a king size bed, a large walk-in closet and an ensuite bathroom incorporating a shower over the bathtub. The Second Bedroom has a double bed and a large closet. The Third Bedroom has twin beds and a large closet which encloses a washing machine and a tumble drier. The Fourth Bedroom has a double bed and a large closet. Bathroom Two has a bath-tub and shower. • Check in 3 p.m. Check out 11 a.m. Early check ins or late check outs require prior approval.